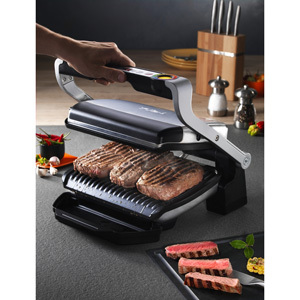 The T-fal OptiGrill is the first electric grill that includes a level of cooking indicator. Now you can grill your food from rare to well done. There is also an alarm that tells you when it is done. Included are 6 automatic functions including burger, poultry, sandwich, sausage, red meat and and fish. With your help we can reach more people and let them know about T-fal OptiGrill whether this product works or not. The optigrill grills great on automatic or manual. Only problem is that you have to be in the room with the appliance when it finishes. There is no indicator showing when the food is finished, only beeps. If you dont hear the beep, you will not know if your food is ready. Otherwise it works as advertised. I give it a B rating.